Our experts can hand make a variety of custom picture frames including lacquer picture frames or gilded frames. Let our staff lend their expertise to your custom framing needs by suggesting the picture frame options that best fit your project! If you need a custom color or finish on your picture frames, we can color match using the entirety of the Benjamin Moore catalog and create custom finishes. We create your lacquered picture frames using locally milled maple, ash, or walnut, which is hand stained in-house. Additional types of woods are available upon request. 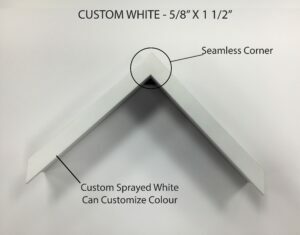 Ask us about special ordering for your custom picture frame. We can create elegant gold picture frames using traditional leafing methods. Our craftsmen carefully apply various colorations of real gold leaf or silver metal leaf foil to hand carved wood frames or plaster ornamentation. 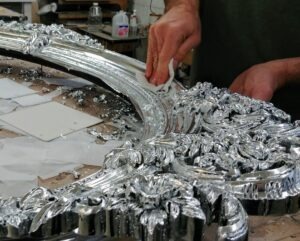 We also have capabilities to repair any gilded picture frame. We can match any style antique picture frame or ornate picture frame. Vitrines, also referred to as plexi boxes, plexiglass boxes, or acrylic boxes, are a great framing alternative that are ideal for protecting and presenting art objects or paintings. Museums or clients with publicly displayed works often use vitrines to protect high value artwork. They are a sealed box, often built with a removable base that is secured with screws painted to be the same color for a seamless look. 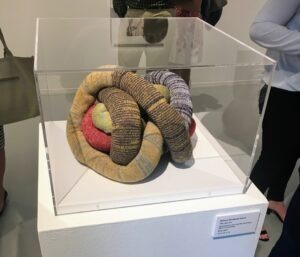 Displayed during Insights II, at 3/31/18 Zolla Lieberman Gallery. Courtesy of Joyce and Dusty Licht Sang and the Ryan Licht Sang Bipolar Foundation.